Would you like to attract, recruit, develop and retain more young people for your company? 1 in 4 graduates is likely to leave their first employer within 12 months (CEB[i]). SMEs (~50%) lag behind large employers (86%) when it comes to employing at least one young person, despite providing 3 out 5 private sector jobs (CIPD[ii]). 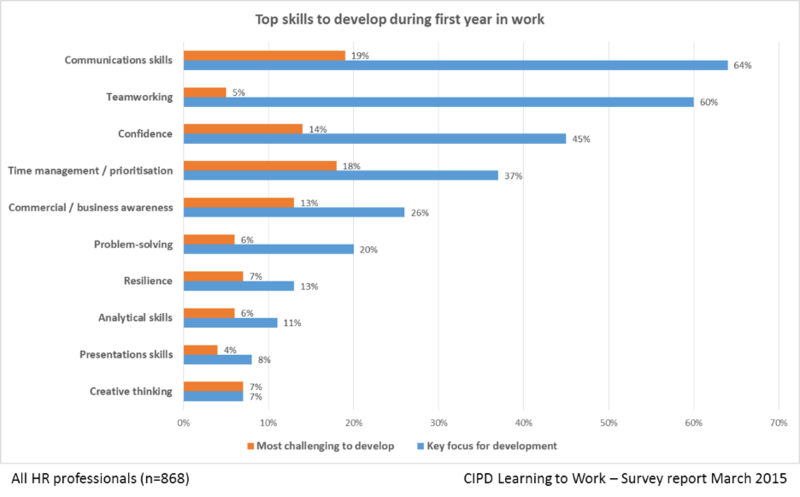 6 out of 10 (63%) employers are concerned about low levels of skills being the biggest threat to the UK’s competitiveness as a place to employ people (CBI[iii]). In the United Kingdom 5 out of 6 (83%) employees are not engaged or actively disengaged. This is only slightly better than the worldwide average (Gallup[iv]). This is tragic but totally avoidable, as you will see. Recent research published by the CIPD as part of the Learning to Work programme[v] focuses on today’s young people being tomorrow’s workforce. It lists the key and most important skills that must be developed in the first year of employment. In the survey, 4 out of 10 businesses responding were SMEs, so this is just as critical to SMEs as for larger companies. genuine interest in their development. skills development and opportunities to utilise their skills, expertise and abilities. recognition for the contribution they make. For inexperienced young employees, it is critical to lay down a solid foundation on which to build their career. If you help them to get this right from the start, then you will build trust and loyalty which will lead to them staying with you for the long term. Not doing this could result in your young employee being the 1 in 4 who leaves your company in the first year. The best way to address the development of these business and soft skills is to provide your young employees with a programme designed specifically for young people, rather than mixing them in with your experienced employees. Due to their inexperience and lack of confidence they will benefit from a graduate-style tailored development programme that will enable them to develop and grow at the right pace, without being overshadowed by their more experienced colleagues. With only half of large employers and just 1 in 9 SMEs currently providing a graduate programme[vi], you have a great opportunity to differentiate your company by offering a graduate-style development programme, and attracting top calibre graduates. It costs money to provide a graduate programme, and is sometimes difficult to quantify the value of it during their first 18-24 months development, however BMW believe they do get real value out of this investment. In particular, it helps with retention of the graduates and very few – below industry average – leave BMW during their early career. You don’t have to have the HR/L&D people, expertise, space or deep pockets to provide one, as you can outsource the business and soft skills development of your young employees. Attract better calibre young people with a comprehensive graduate-style development programme. Rapidly integrate your new employees into their team and department. Retain employees for longer, thereby avoiding massive costs in terms of both time and money. Increase promotion and career prospects, and experience greater responsibility and higher income. These are the reasons why we created the GradStart™ programme, to support businesses just like yours, and ensure that your young employees are effective, productive and a valuable member of your team – right from the start.